How long are hard-cooked eggs safe to eat? 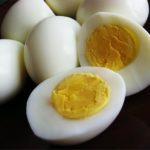 Why do hard-cooked eggs spoil faster than fresh eggs? Hard-cooked eggs should be refrigerated within two hours of cooking and used within one week. Shell eggs have a protective coating that is washed away when they are hard-cooked. This leaves the pores in the shell open for bacteria to enter.